University of Nottingham > Blogs > Thinking Politics > Student voices > Driving Mr Powell: When Nigel Farage met Enoch Powell. Nigel Farage’s admiration for Enoch Powell is no secret. He is on record as naming the controversial former Conservative politician as one of his greatest political heroes. However, research into Enoch Powell’s Archives housed at Churchill College, Cambridge and an interview with UKIP’s former leader, Alan Sked, reveal the details of the day that Farage once acted as Powell’s chauffeur. In the run up to the Newbury by-election which took place on 6 May 1993, Powell had agreed to attend a town hall event where he spoke on behalf of Alan Sked, who was the leader of the Anti-Federalist League, which he later renamed the United Kingdom Independence Party. Powell’s diary entry read for the date of the event – 4 May 1993 – read: ‘Collected by car – (driv. N. Farage)’. When Alan Sked was interviewed on this point, he commented that Farage relished the opportunity to meet Powell, but was unable to strike up any meaningful conversation with him because the latter was saving his voice for the speech that he would give later that night. The transcript of this speech has been unearthed in Powell’s Archives through the discovery of previously unrequested audio tapes. Powell’s speech did not mention UKIP once and revolved around tracing the process of European integration from 1970 onwards, culminating in his strong opposition to the ratification of the Maastricht Treaty. For Powell, this town hall event was greater than any one individual or party. A year later, Farage, now the UKIP candidate in the Eastleigh by-election, wrote to Powell, asking him if he would similarly come to speak in his support. 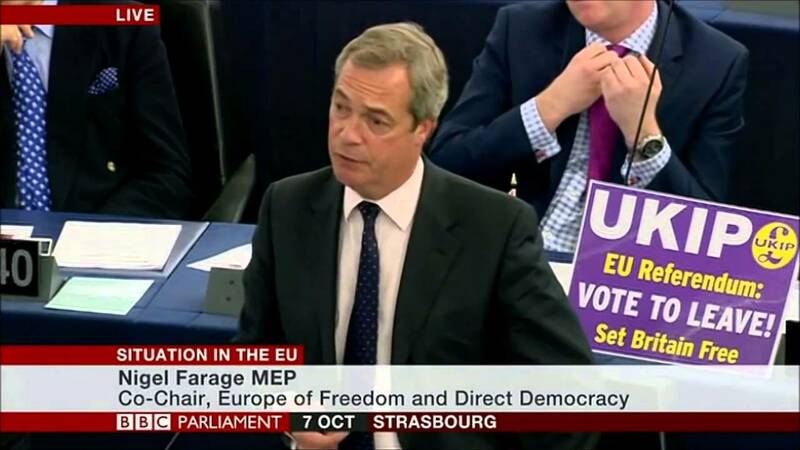 In the letter, Farage said that he had ‘everything in place to fight a good, aggressive campaign but a voice from you could transform things…please give us the help that you can’, adding that publicity was the ‘essential ingredient’ that UKIP needed to enhance its prospects as a political party, before concluding by offering Powell ‘transport, dinner and whatever you need’. Powell replied, five days later, and in a two line letter, told Farage that he had given ‘very serious consideration to the request’ but had ultimately decided that ‘I do not feel I can contribute further to the campaign by speaking on your behalf’. Farage should not take it too personally, however. In 1994, Powell was 82 years old, and in ill health, suffering from Parkinson’s disease. During this period the archive reveals that he declined many similar public speaking requests. Powell’s response to one UKIP member who asked him to appear at a party event was that only ‘a party likely to win a majority at a general election’ could facilitate the cause of leaving the EU. Nonetheless, this did not prevent him from endorsing two UKIP candidates – Alan Sked, as detailed above, but also Malcolm Floyd – the UKIP candidate for the Dudley West by-election that took place on 15 December 1994. The latter received a written endorsement from Powell in November 1994. Farage may have chauffeured his hero, but his hero did not reciprocate with help.